As a Prime in service to the Queen, Emma goes where she's told. What sets her apart from the other Primes is her determination to see the mission completed, no matter the cost. And if her conscience gets in the way, it's a small matter to silence it. For Emma, loyalty to the Queen comes above all else. When she's sent to track down a strange fanatic who fled the country, Emma has no idea of the horrors the man left behind before he left. When Emma brings him before the Queen and he dies rather violently from the poison he made, she begins to realize not all is as it seems. Perhaps her ruler hasn't been as forthcoming as she should have been... But it's of little consequence now, for the poison is spreading through the city at an astonishing rate, decimating all in its path. In desperation, Emma turns to the one person she feels can solve the mystery--her friend and mentath, Clare. He will have to use his considerable brainpower to find a cure for something that hasn't been seen in centuries--the Red Plague. This book describes in horrifying detail what it must have been like during the Black Plague. It sucked me back into a time when death ran rampant through the streets, and hope fled along with those wealthy enough to pick up and leave. This book was impossible to put down until I was done, because the suspense of poor Clare rushing to find a cure to undo the damage a madman had done didn't allow me any other options. You didn't know who was going to die next, or what new enemy would show itself and destroy everything. 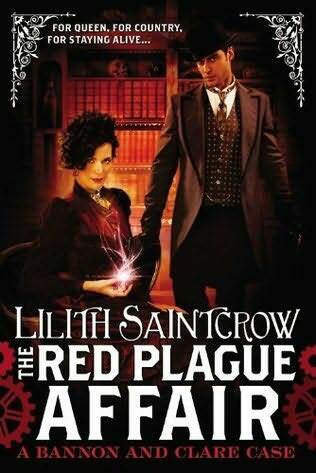 Lilith Saintcrow's books are an auto-buy for me, because she's a master at taking the glamour of the paranormal and stripping it away to show us how life would truly be if such a thing existed. I'm really, really hoping she continues this series, because I'm well and truly hooked now.